My emotions run high most of the time. Any given day they can be all over the place. But hey, I’m a woman and a caregiver so there you go! I deal with a “living grief” since my son is here – but gone at the same time. So as I journey through peri-menopause and things continue to change.. I can tear up at the drop of a hat. However, I still see no point in crying since whatever you are crying about – doesn’t change just because tears fell. So why bother? But today as I had taken Chris to therapy and had time to drive and think this last 7 years started running around in my head. This weekend is the anniversary of the wreck that took him away from us. I keep seeing the scenario over and over in my mind. I was at work and my daughter called to tell me that my son had been in a wreck and he had been mediflighted to the trauma center in Shreveport. I had no idea how extensive his injuries were but I knew if he was mediflighted it was not good. I also had no idea what the next days, weeks, months or 7 years was going to look like. So many things have changed over this 7 years. Chris is doing good, and making some good progress, but he’s still total assistance with everything. I honestly have to ask myself if this is it. Will he be able to do much more than this? Is this what the next 7 years looks like? Do you know how old I will be in another 7 years? Is this all my life will look like…forever? Add to these emotions the fact that I just feel so insignificant and like I really don’t fit anywhere or with anyone. I know all the shoulds– but that’s just how I feel. Sometimes the alone-ness swallows me up and I feel like I am barely alive. And just about the time I get it all together and am actually having a tiny little social life….the anniversary starts nagging away. what if I’d have known it was our last conversation? Would I have said anything different? I don’t know. I have tons of questions. But I’ll spare you. I have to say this 7 years has left me in a time warp. For so long I felt like I lived in the cave. Then when I was out – I wanted to go back to its safety! lol I have changed a lot, life has changed a lot. I don’t have time to waste with dumb stuff and I don’t put up with as much nonsense as I used to. I have learned to not sweat the small stuff… and to choose my battles wisely when I have a choice. I’ve learned a lot about me… good and bad. Faith has been an issue too. It took me quite some time to redefine and accept a new definition of faith. I’ve shared before that I always thought of faith as what kept us safe – protected us from life’s harms. And now I realize instead it is what carries us through them not around them. Trusting in God had also been an issue – I thought He’d take care of my son since I was doing His work. Instead, I found that doing His work is taking care of the least of those among us. And now – I trust Him for every breath. I must say my faith is deeper and my trust is wider than I ever thought possible. Now I do not cling to them like a lucky charm hoping they will prevent bad things from happening. Instead I cling to them as a life preserver – that’s going to carry me on over the rocky waves. Even though for the first few years I felt like I fell far away from God and I felt abandoned by Him, now I am so much closer and it is so much sweeter. I think the best analogy is how the crushing of a flower releases the sweet fragrance. When we cherish Him in spite of the journey, our lives will emit a fresh, beautiful fragrance that is pleasant and wholesome. I’ve been crushed and horrid fumes have come out! But now I am seeing a fresh fragrance of worship as I let go of my life and let Him reign again in my heart. A worship I haven’t experienced in a long time… or ever really. so close every time I call…..
And that is where I am after 7 years. Talk to any caregiver and they can tell you (but probably won’t) how difficult each day can be. You just never know what you’re going to face when you get up in the morning. Of course, there’s all the basic stuff – and quite frankly, that’s enough. But throw in a run to the urgent care clinic or ER and stress levels can soar even higher. That’s how it’s been around here for me for some time now. It’s like virtually everything is all screwed up. It can feel like you’re spending all day every day trying to figure life out. For me, I have been thinking about how confined I feel. How much “loss” I have grown accustomed to on this walk. If I get started with that line of thinking I can quickly be taken under by it all. Sometimes I can shake off those feelings of not having a “normal” life. Other times I get overwhelmed by the loss of freedom. But it’s a choice I make so I can take care of my son. And sometimes I am able to turn it around in my head and use it for incentive to work harder. If I work harder I can make more money and if I can increase my level of income I can do more, we can do more. But today I’m just tired having my own fight with health issues and a brief stay in the hospital last week has worn me out. Some days it helps me focus – other days it drags me down into depression which is hard to get out of. But I am making it one day at a time. First of all, I’m having to learn how to take care of me. As caregivers we can forget that too easily. We are so focused on taking care of our loved one – we forget to give ourselves the same TLC. We really don’t think about it, until something happens. That’s where I’ve been for almost 2 years now. As I come to grips with my own health issues I have to realize that in order to take care of my son – I really do have to remain focused on myself. If not for myself – for him. I tend to ignore health issues until they are much harder to manage than they would be if I just addressed them early on. So, here I am having to face some things I’ve tried to push aside for 2 years and they just grew louder until they literally got me down a time or two. I’m still in full-blown denial that I have any issues to begin with. I say all that to say – it all adds to this tiredness. One thing people tell me is I need to “give myself credit” – I got a lot on my plate. Yeah, okay. I acknowledge I’ve got a lot on my plate – but there’s not much that can be removed from said plate. 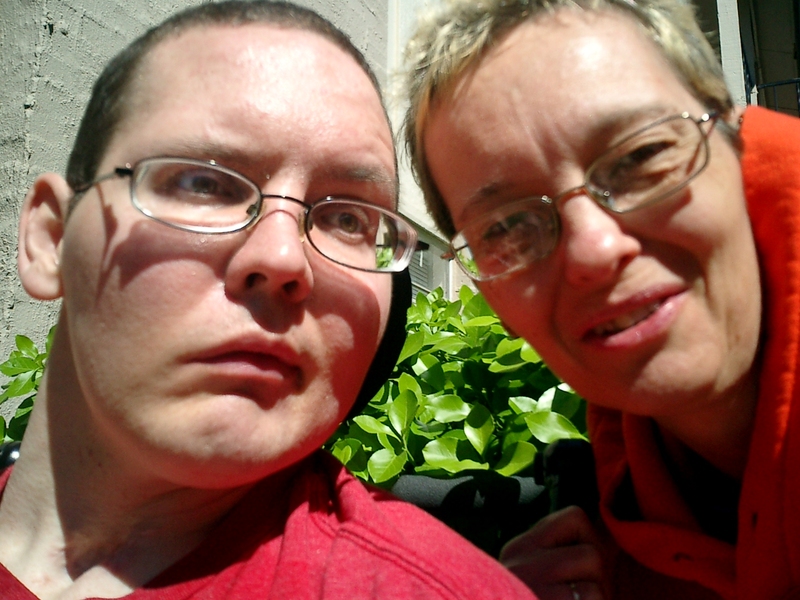 Chris is doing real good right now and his care takes more time – not a complaint in any way – just a fact. a very happy fact! He’s awake more – eats more moves more – and all that requires more action on my part. That’s wonderful – BUT – I also have to try to make a living and time runs short. So I push, and push and push to get everything done in a day…. and always come up short. That’s how it feels anyway. Some days I look at emails from my clients and think I just can’t deal with you guys today. But that’s how I make my living and I do really like to eat….and race. And both of those require money! lol So I talk myself into pushing through one more day. My point is that caregivers get tired – but we can’t tell anybody. We can’t take a chance at letting anyone know how we really feel physically because we never want to think we might not be able to take care of our loved ones. So we may not eat, may not work, may not exercise – but we will take care of our loved ones. No matter how tired or rundown we feel – we are going to take care of them. So that’s how I really feel. So yesterday, my son had to be taken in to the hospital since the home x-ray tech said Chris had pneumonia on both sides. (He didn’t – but that’s what they said) I was sitting in the waiting area of the ER and I pulled out my phone and plugged in an ear bud to listen to Worn by Tenth Avenue North. It does a fair job at describing how tired I can feel. Some days as the song describes it takes all my strength to keep on breathing… pretty much! So I am thinking about how tired I am (yes – I was focused on my own feelings shame on me! ), listening to Worn and then this phrase grabs me: I’m worn I’ve lost my will to fight…. and I got mad. I have NOT lost my will to fight. All of a sudden I’ve unplugged the song and am raring to go once again. I will never lose my will to fight. It’s funny because I’ve listened to this song a hundred times and that phrase has never grabbed me like that. It was just the jolt I needed to stand back up spiritually and say – I’m not done here! So obviously I made it through another day and am ready to go again. I am learning to draw closer to Him and to let Him be my strength. My life hasn’t ended – it’s just way different. When I’m at my weakest point I must rely on Him to lift me up and not try to do it myself. Yes I am still a Type A – yes I am still a workaholic – yes I am still tenaciously pulling through – but He is ultimately my strength. Sometimes I have to stop and do a lot of letting. I have to let Him be my strength, let Him pick me up, let Him sooth my soul, and let Him bring comfort. Not always easy – but always do-able. Here’s a link to the video: Worn by Tenth Avenue North. Just rest. Sometimes, okay – most of the time, as a caregiver I feel like I just stick out in life. It feels like I don’t really fit anywhere or with anybody. There are a few places we go – most of them necessary and I just learn to adjust, adapt and advance. Such is life right now. Even though we do get out more – and I’m getting out more specifically since we finally have a decent aide, it still feels like I’m just out of sync with the world. My life is just different period and all I can do is make the best of it. There are many negatives that I could focus on. For instance, it’s not easy navigating around with Chris and is oversize chair. I used to be embarrassed by his drooling. And I feel socially dwarfed in most situations because of the lack of social activities. Add to that things like trying to find a spot to park our handicap van where I don’t inconvenience others (I fondly call it our “tank”.) and I can be emotionally drained just from going out. I only mention these because they are things that caregivers just have to deal with – and just have to get over. But the other day I took the tank in for an oil change. First of all the attendant was very friendly. I had a coupon for the oil change and he pointed to the price and said that was correct but if the van needed more than 5 quarts of oil it would be $8 or $9 more. I asked him if he knew how much I could get a quart of oil for at Walmart. (I don’t shop there any more btw!) I said, “I’ll tell you what then. You put 5 quarts in for that price and tell me if it needs another quart – I’ll add a quart at home!” He told me he would cover it for me not to worry about it! lol But he was just so friendly and kind. He has no idea how his whole demeanor affects others in a positive way. We even talked about the old school wringers like my Auntie Pat used to have. We laughed and decided we’d prefer the computerized models of today. We talked about hanging out clothes to dry. So many memories were crammed into this 15 minute spontaneous conversation among strangers. I noticed at one point a young lady came in and looked around. She stood there for a minute and then left. As I was driving away I noticed she was setting outside alone and her cell phone had all her attention. I felt sorry that she couldn’t glean anything from our conversation about nothing important. Because it meant so much to me. I left there feeling light and cheery; and I didn’t even know why. I thought about it for quite some time and think I know what happened. For just a minute or two – I wasn’t a caregiver – these ladies knew nothing about me. I was just a person – just like them. I’m sure they each have their struggles too because they were breathing just like me. We talked about nothing and it was beautiful. I’ve given up hope of ever being normal whatever that looks like. But for a moment I almost felt human again! As a caregiver people don’t know what to talk about with you for some reason. I really don’t want to talk about caregiving all the time… there’s more to me than that….I think. I have a good friend who comes by now and then and brings me coffee and we visit. It always makes my day! We talk about anything and everything and it takes me out of caregiving for a bit – and is refreshing. If you know a caregiver – give them a call. Take them some coffee. Take them a magazine or book or even a movie that would interest them. And then talk about it. They probably still like to play cards other games. Their likes didn’t change – just their situation. They have given up all that stuff for a couple of reasons. First, there really isn’t always time. Secondly, everyone stopped playing with them…so it’s easier to just cut it from their lives. Caregivers are giving their lives for someone they love. But they are still alive, still human and still have hopes, dreams and desires. Don’t bury them by ignoring them. The social isolation that comes with the caregiving package is one of the most damaging aspects of the journey. Some of that is because even when we are out in social settings we’re still not like everyone else. It’s difficult to watch others be uncomfortable with who you are. I am to the point I don’t care really – I will try to stay out of your way- but you have some adjustments to make if I am in your way. Go love a caregiver today. James said that pure religion and undefiled before God is to visit the fatherless and the widows in their affliction; and to keep oneself unspotted from the world. Caregivers are not necessarily widows or fatherless but I think they fit into this category. They are separated from normalcy and social interaction for the most part. It’s not that it’s a command – but it’s just something nice to do outside your box. I would suggest to visit anyone out of your norm. Perhaps you know of someone who is in a nursing home, a hospital or otherwise home bound. Maybe they can’t attend your worship service. Maybe they no longer want to – because of how awkward they make you appear. Christianity wasn’t designed to be lived out inside the four walls of the church. Keith Green sang, Jesus told us to “go” it should be the exception if we stay. Do some true ministry today and go love on someone who is hurting – you’ll be surprised how much healing it brings to you. Social media can be a very good outlet for those of us who live in a cave. It’s good to hear other people’s point of view and even though it’s long distance you can connect with others. But there’s some things nagging at me that I’ve seen on Facebook the last few weeks. On one hand, they are very good and encouraging; but on the other it’s raised some questions in my mind about how we interpret the goodness of God. You know I am the caregiver for an adult son who was seriously injured in an automobile accident nearly 7 years ago. I see posts of wrecks and how other’s loved ones narrowly escaped serious injury. There are many times when people are sharing that they are so thankful because it could have been a lot worse. They thank God for saving their loved one; and they should! But then they cap it off with something like “God is good!” And of course, He is. But would He still be good had your loved one suffered a TBI like my son? Would He still be good if your loved one perished as in so many other cases? This morning I saw another post giving thanks (and they should!) for someone who had been sick and it didn’t last as long as typical cases of this particular disease. 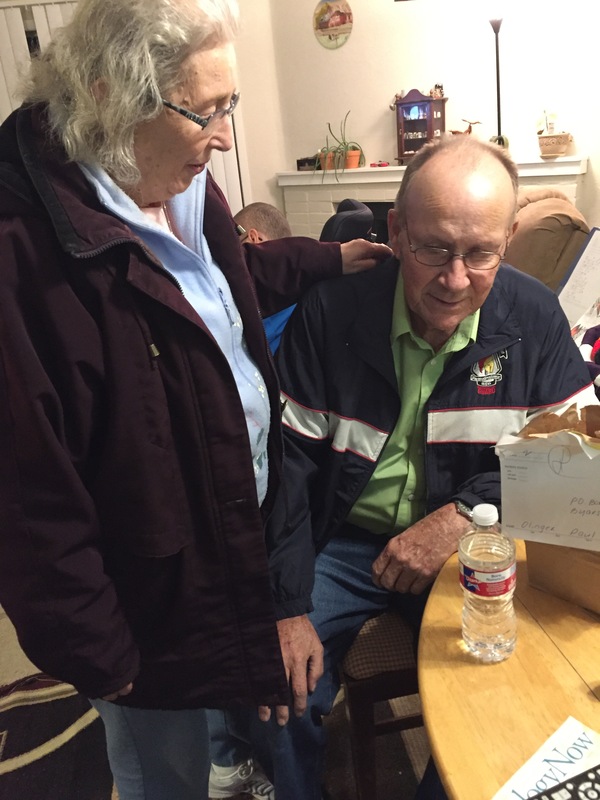 They were so thankful it was over – and I was too. Who wants to see people suffer? No one. They finished it off with God loves us! I was like – does He not love us when the sickness endures for longer periods of time? Would they have randomly posted that God loved us just because if they were still suffering? I’ve come to this conclusion – God is either good – or He isn’t. He either loves us or He doesn’t and neither of these can be measured by what we face each day. Was God any less good when He didn’t spare our heroes of faith? Stephen was stoned to death with no escape, Job became very ill and lost everything (you cannot replace children! ), Elisha became ill and died was God still good then? And He did not spare Christ from going to the cross….does that make Him any less good? While I rejoice with others who are spared journeys similar to mine – I must say that God is no less good when things don’t turn out like we prefer. He doesn’t love us any less when life takes a rough turn, or we lose. I will be the first to tell you that I’ve had an attitude about this. When my son was first injured I honestly expected God to come riding in on a white horse and rescue us, spare us from such a painful situation. As time went on He didn’t show up like I thought He would. I took on an attitude (a bad one). One that said, I served You and Your people all these years and You were supposed to protect us! I cried, pleaded, cussed and yelled at God many times over the last 7 years. He calmly waited for me to settle down and come back to Him so He could demonstrate His love to me and through me. But He didn’t make it all go away. And you know what? He’s still good. His goodness and His love does not spare us from tough situations. He loves us whether or not our loved ones are injured or killed in automobile accidents. He loves us and His goodness endures even through the roughest of situations. We cannot use what we are going through as a measure of how much He loves us. He just loves us. In Psalm 23, David says that goodness and mercy would follow him all the days of his life. Have you read about his life? Yes, he slew a great giant, yes he became king. But he also spent years running from Saul who had evil intent. He lost a son too. Yet he continued to proclaim the goodness of the Lord. What about Joseph? He spent years patiently waiting for God’s promise. Was God any less good those years he sat in a prison cell for something he didn’t even do? Was God any less good or less loving when his brothers sold him into slavery out of spite? God is good – even in the deepest, darkest dungeons of life. God is good when our loved ones are spared from tragic accidents or serious injury. But He is just as good when they are not. Sometimes You Just Need a Little Attitude! I have to admit I have an attitude most of the time. I’ve been known to walk around with a chip on my shoulder just daring anyone to knock it off. 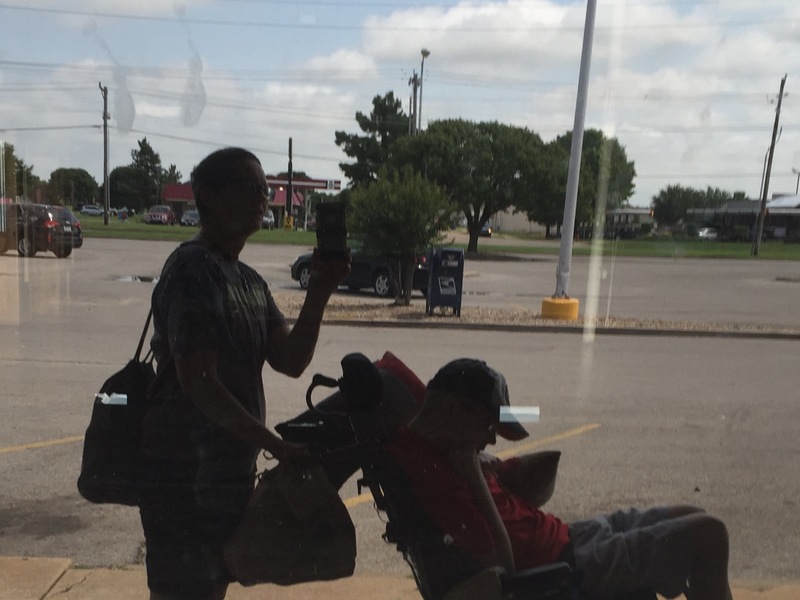 When I brought my son home and he finally got to the point that I could take him out it was an understatement to say I felt very self conscious. I have never been one who likes to draw attention to myself and this grown man in a bulky chair does just that. And of course – I can be very clumsy at times so I do things accidentally to make it harder to be inconspicuous. In stores I often run into stuff and if I’m buying more than a couple of items his lap isn’t big enough and things get dropped! It’s actually quite the show. lol It’s okay – I’m used to it – I run into stuff at home too. I’ve finally learned the best way to navigate the stores is to push Chris in front of me while pulling a cart behind me. It’s not quite as awkward feeling as it was at first. We’ve done it long enough now that I feel funny when I go to the store without him and his chair. I described these to say that I swallow a lot just to get out – but it’s getting easier all the time. I’m getting more comfortable with it and I don’t dread getting out like I did for a while. However, I notice that others are not always as comfortable with it as I am. I did have a worker at one store offer to push the cart or Chris for me the first time I went. But I declined as that was awkward and I would feel like I had to hurry. People stare — grown people at that — sometimes we get a nod of compassion. I always wonder what people are thinking when they look at us. Do they have a loved one that is in a similar situation? Do they think we should stay at home? Who knows – just like they have no idea what I am thinking about their blank stares or compassionate nods. I have to say that I developed an attitude when we would go out. Some of it is bad, some of it is good. Sometimes I play through this scenario in my mind that someone says something rude and I punch them! lol – I go to town mad and ready for someone to just say something! In most instances no one says a word (lucky for them!). But we do catch some attitudes that I always choose to ignore. Earlier this week I pushed Chris down to the grocery store on the corner. It’s a nice walk we just have to go early and not buy much. We get some fresh air and sunshine and grab a few items we are in need of. It’s actually a good little outing for us both. Here’s a pic of when we went the other day – I obviously bought too much! I never know if I’m going to feel like I’m in people’s way or not – and I hate that feeling. But I think I’m sort of over the attitude part. I’ve gotten to the place that it really doesn’t matter. I know I’m not going to do anything on purpose to be in someone’s way. In most cases people navigate around us easily enough; but sometimes they cut in front of us quickly like they want to hurry – and yes – I am tempted to run them over – and on a bad day – I just might! On the way to the store, we met a lady with a dog. I feel like we hog the sidewalk so I usually try to make a joke about Chris needing to lose weight. She stopped and talked and let her cute little doggie lick Chris’ nose! It was a pleasant conversation. Then the clerk at DG talked to me about her son who works with “people like” Chris. It was a friendly gesture and very nice of her to share. When we got to the Buy4Less the clerk actually spoke to Chris (guess we’ve been in there a lot!) she said, “good morning there!” It means so much when people go out of their way to speak to him as he is mostly ignored which I understand…..On the way back to the house I wondered if it was my attitude that made it a perkier trip. Who knows? For so long I have felt so all alone on this journey even though I know I never am alone. It takes a lot of people to help me out here and there. People sit with Chris, help me take him somewhere or help out in some other way. For instance, there’s a church that sends us food, gifts and gift cards periodically. It’s helps so much and is such a blessing. Then there’s my friend PD who is always trying to get us out of the house. She isn’t bothered at all but she works in long term care. Which is actually a reason she could avoid us – too much like work! And the friend who called this morning to say he’s coming by one day next week to put something in my van to hopefully fix the air problem. What’s my point? I’m choosing to see the positives instead of the negatives. While there will always be jerks out there – I am not going to let them steal my focus. I’m taking my thoughts captive (2 Corinthians 10:5) and choosing to think of the positives – those who go out of there way to help us, speak to us and develop a relationship with us, rather than those who just put up with us or feel we get in their way.Their loss. Today is July 1st and it marks the anniversary of the day I brought Chris home from Valir Rehab. I have to say I was terrified but determined. Living in the furnace and keeping faith is the theme of this blog, and I must say that over the last 5 years I’ve experienced both. The furnace is still hot and there are challenges to be met everyday, as all caregivers know. But at this point I am happy to report that I have kept the faith and I’m still fighting the fight. This half a decade has been full of good things, bad things and in between things. 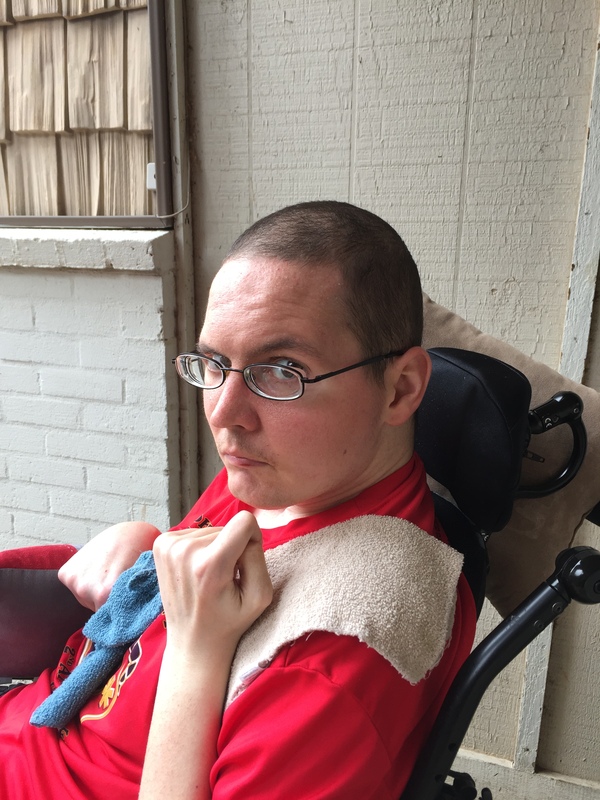 Even as I type this post about bringing Chris home I am just emerging from a season overwhelmed by the caregiver’s fog. Honestly, I must say the fight against depression is a daily one, but one I am presently winning. The biggest thing that stands out in my memories of bringing Chris home was how afraid I was. Transfers scared me to death! I would feel myself tense up when I knew it was time to get him up or put him to bed. I can actually chuckle at that now – because he’s come such a long ways. He had so much tone back then that he was stiff as a board. He would stand up easily enough because his body would go rigid. Sitting him down back then was another story because many times we would just be stuck standing there until he was able to loosen up just enough to give me a little bend to work with. Today- he stands up, he pivots and he sits. Here’s a picture I shared right after I brought him home. He didn’t do much of anything at all back then and he had that brain injury expressionless face. Back then he got up for an hour in the morning and then an hour in the afternoon and he slept most of the time. It’s been a gradual journey but now he gets up around 9 or 10 in the morning and retires between 9:30 and 10 at night. He still gets a short rest time in the afternoon. Back then I was glad if he ate a tablespoon of food and presently he’s eating 3 small meals a day and I am having to rely on tube feedings less and less. Now he has so many expressions that range anywhere from beautiful smiles to looks of disgust or displeasure. I can pretty well guess what he thinks about things by his reactions. He also looks right at you and he can watch an entire TV show or movie if it catches his attention. All I can say is he has come a long way and I just want to share my thankfulness today that he is continuing to improve and I am still hanging in. I have to say that other than dealing with the situation and the living grief on a daily basis one of the biggest things I had to get over was taking him out in public. I had to get used to the stares. In many ways I still feel like I am intruding into others lives and spaces by taking up so much room in the grocery aisle or booth at a restaurant. But I figure if it’s a problem, then someone else is the one who has to get over it at this point. We no longer live in a cave. Many things have changed over the last 5 years (almost 7 since the accident) I cannot say I have handled them all well. I’ve fought, screamed, cried and cussed; but I have endured and come out ahead at this point in the game. Holding on to our faith sounds like a good thing to do until it is shaken. I admit mine has been shaken and at times I wanted to give up on it all. But I have always returned. The road has been rocky and I have not been a real good example many times, but today my faith is stronger than ever before. However, it is definitely worth mentioning that for me, faith, has been completely redefined. In my world, God is not going to come riding in on a white horse to save us and make everything go our way. But He is going to walk it out with us and give us the room to throw a fit now and then. And as ugly as those fits can be – He always has welcoming arms waiting for us to settle down and snuggle up with Him again. I guess the phrase I would chose to use is I’ve come to be at peace with my situation. Maybe I view it like the 3 Hebrew children viewed the fiery furnace in their day. I know God can deliver me at any point; there’s no doubt He is able. But like Hananiah, Mishael,and Azariah I have to say but if not…..I’m still going to serve Him. And like these three men of great and true faith – I’ve found He walks in the fire with me. And today – 5 years later – I must say I’m okay with that.